TensorFlow is a programming system in which you represent computations as graphs. Nodes in the graph are called ops (short for operations). An op takes zero or more Tensors, performs some computation, and produces zero or more Tensors. To compute anything, a graph must be launched in a Session. A Session places the graph ops onto Devices, such as CPUs or GPUs, and provides methods to execute them. These methods return tensors produced by ops as numpy ndarray objects in Python, and as tensorflow::Tensor instances in C and C++. 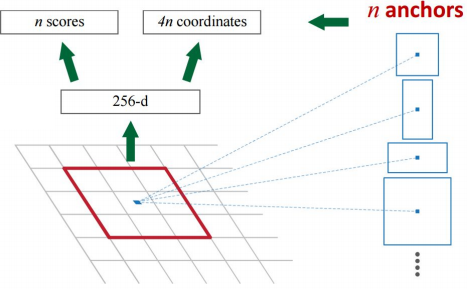 Formally, tensors are multilinear maps from vector spaces to the real numbers. Intuitively you can think of a Tensor as a n-dimensional array or list. Tensorflow programs use a tensor data structure to represent all data. A Shape: is another way to describe tensors dimensionality. The computation graph is the definition of the relations among input tensors, ops, and output tensors. Construction phase: assembles the graph. Defines the relations between tensors and ops. Execution phase: uses a session to execute ops in the graph on a specified device. Until now, we used Tensorflow graph to compute ops on constant values. But in Machine Learning we need to define a model and then feed it with data. To achieve Tensorflow has the concept of placeholder: a symbolic value placed in the graph that has to be replaced with a real value at execution time. The common use case is the use of placeholders as input value of the model. The optimization algorithms used in Machine Learning work with incremental changes of parameters, in order to optimize a function. Tensorflow variables maintain state across executions of the graph. Thus the optimization algorithm update the variable values to minimize the loss. Using a graph to represent computations, tensorflow knows the flow of tensors across this graph. Therefore, after defining a loss function for the current model, tensorflow can apply the backpropagation algorithm in order to efficiently determine how your variables affect the cost you ask it to minimize. Now we can easily train the model feeding it with the current batches of data. The following example represents a SGD (Stochastic Gradient Descent) application. Tensorflow makes the definition of deep architectures easy. The following example (from the tensorflow website) is a simple 2 layer conv net built to classify digits. 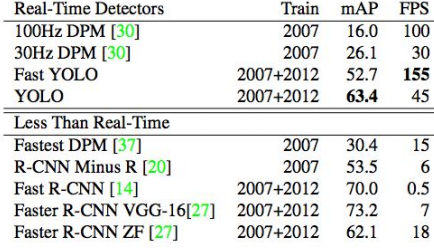 Trained on the MNIST dataset. The second conv layer extracts 64 features for every 5x5x32 input volume. 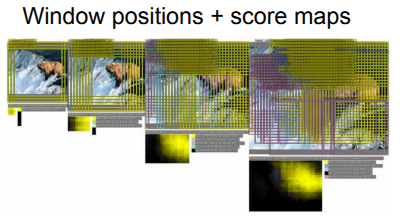 The first FC layer has 1024 neurons fully connected to the 7*7*64 features extracted. The dropout operation is executed in function of the keep_prob placeholder. Finally the read out layer converts the 1024 features extracted to 10 probabilities. 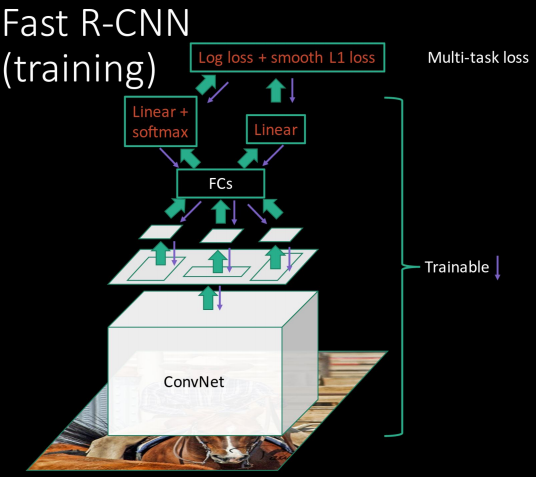 The tensorboard results are based on the MIT CBCL face datasets. The architecture is similar to the one discussed previously. 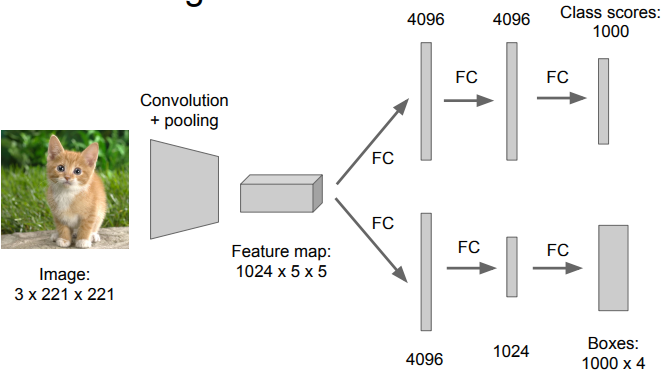 Having only one object to detect, image classification+Localization is simpler than detection. 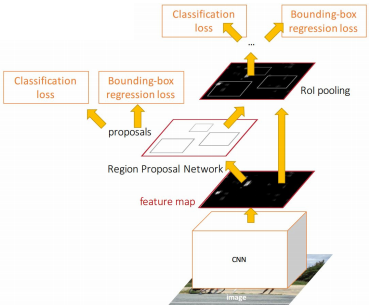 We exploit a pre-trained classification model to do the regression task. Change the architecture, attach a new fully-connected regression head to the network. Train the regression head only with SGD and L2 loss. At test time use both heads to predict class + box coordinates. The classification head produces C numbers: one per class. The regression heads can produce: 4 numbers: if the regression head is class agnostic. 4 x C numbers: if the regression head is class specific. 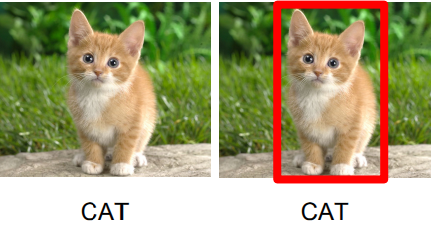 Problem: images have different sizes, the object can be in a non central position and have a different dimension from the learned one. It works and it's pretty easy to implement. Problem: need to test many positions and scale for every class C.
Possibile solution: look only at a tiny subset of possible solutions. Region Proposal: class agnostic object detector for blob-like regions. For each region: warp the region to CNN size, run forward trough CNN and save last pooling layer features to disk. For each class: train one binary SVM to classify region features, previously saved to disk. For each class, train a linear regressor model to map from cached features to offsets to Ground Truth boxes to make up some "sightly wrong" proposals. Problem #1 solution: share computation of convolutional layers among proposals for an image. 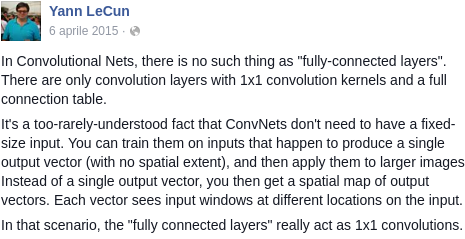 Remember what Yan LeCun said? The feature map (SPP layer) is computed only once for the whole image (for each class). 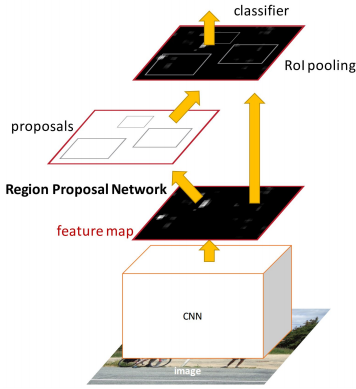 The proposals are projected into the feature map location and the features in that region are passed to the FC layer for the classification task. Problem #2 & #3 solution: train the whole system end-to-end once. mAP: “mean average precision”. The mean of all IoU (Intersection of Union of bounding boxes detected with the ground truth bounding boxes) for each class and then average over classes. mAP is a number between 0 and 100. The higher the better. Solution: just make the CNN do the region proposals too. 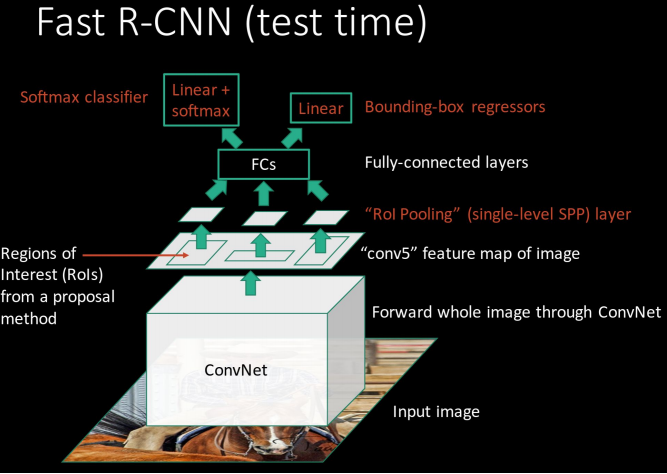 Insert a Region Proposal Network (RPN) after the last convolutional layer. RPN trained to directly produce region proposals; no need for external region proposals! Position of the sliding window provides localization information with reference to the image. 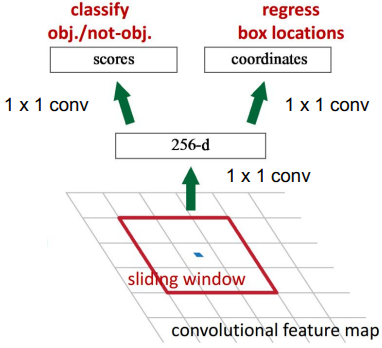 Box regression provides finer localization information with reference to this sliding window. Use N anchor boxes at each location. (N is the number of classes). Anchors are translation invariant: use the same ones at every location. Regression gives offsets from anchor boxes (4n numbers -> regression head. Class specific). Classification gives the probability that each (regressed) anchor shows an object. Apply a single neural network to the full image. 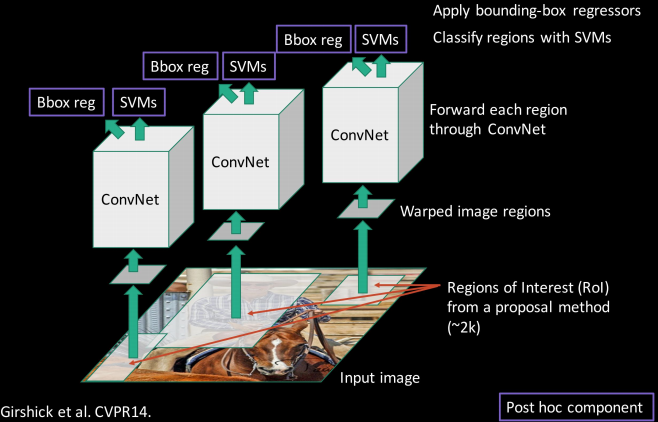 This network divides the image into regions and predicts bounding boxes and probabilities for each region. These bounding boxes are weighted by the predicted probabilities. Then treshold. Resize input image to 448x448. Divide image into S x S grid. 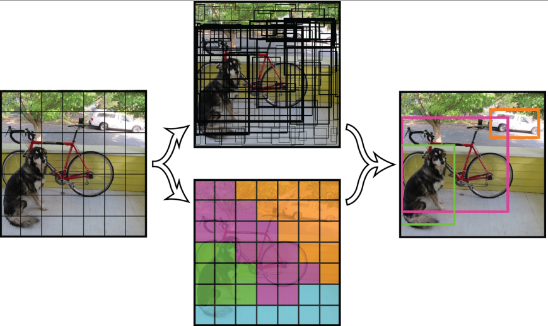 Regression from image to 7 x 7 x (5 * B + C) tensor. Yolo is extremely fast, as you can see in the video. Yolo is faster than Faster R-CNN, but less accurate.